Landa Mobile Systems delivers 20 LMS 106 HW units. Closing out the year with a nice order for the Bahamas. When it comes to reliability Landa units are a hands down winner. Thank you for your support. No Maintenance: Cables must be lubricated and coated on a continued cycle they are one of the most important parts of the mobile tower. This client never serviced the cable from day one and was subject to acid rain and salt air conditions. Now this unit is out of commission and needs a complete new cable restringing, and could have been totally avoided. Landa Mobile Systems in testing. Are you concerned about the growing risk of unmanned aerial systems among insurgents and other adversaries? Do you believe more needs to be done to protect bases and personnel at home and in theatre from these systems? Threat of drones to civilian sites, companies are now exploring the safety and risks including military bases and personnel. The use of our mobile tower is an excellent platform for this solution. Units configured with 240 / 50Hz operational power configurations and ability for deck equipment expansion.The large deck offer clients many choices in deployment configuration setup with the very reliable 150′ portable tower. Units configured with 240 / 50Hz operational power configurations and ability for deck equipment expansion. The large deck offer clients many choices in deployment configuration setup with the very reliable 150′ portable tower. LMS150 HD with 6ea 6′ panels, microwave dish and 12 runs of 1 5/8″ Heliax. There have been some substantial storms since and with its rating of 95mph and 1/2″ Ice carrying this load has not been a problem. NORTH ADAMS, Mass. (WWLP) – Work on portable communication towers in North Adams is finally coming to a close. Both of the portable towers that were put in place by Verizon and At&t are fully operational. Landa Mobile Towers came into play and 22News spoke with Brooke Thomson from AT&T and she said last night around 9 o’clock their portable tower was up and running. She said coverage should be fully restored, if it has not been already, for all residents who have AT&T. Today was actually the first day that flashing signs were put up around city lines. They warned drivers that once they entered North Adams cell service would be disrupted. However, today with the portable towers running, service was much better than in days past. 22News was working for you to learn how the tower collapses have affected businesses in North Adams. For some, having no cell signals didn’t disrupt daily operations. But for others, it was a huge problem. It’s going to take a couple months to get the actual cell towers fully repaired. But in the meantime, the portable towers are expected to fully restore service temporarily. Mobile towers have been in existence in the west for over 50 years now, and the World Health Organisation (WHO) has analysed over 35,000 papers over the years, before concluding that there is no correlation between emissions from mobile towers and public health. India’s telecom secretary J S Deepak, who was also the health communications specialist with the Johns Hopkins University earlier, knows a thing or two about creating awareness. “You can toil for years to spread a positive message about good health practices, but a negative nugget spreads like wild fire even if it is a rumour,” says Deepak, likening the trend to the current public opinion about mobile towers. “The new generation mobile towers emit less radiation than the mobile phone itself, and even lesser than sunlight. They are absolutely safe,” the Delhi-based bureaucrat tells dna in an exclusive chat, ahead of a seminar on EMF Emissions and Telecom Towers, which was held in Mumbai on Tuesday. Mobile towers have been in existence in the west for over 50 years now, and the World Health Organisation (WHO) has analysed over 35,000 papers over the years, before concluding that there is no correlation between emissions from mobile towers and public health. “Activists against mobile towers may be well-meaning, but they should rely on real evidence instead of resorting to rhetoric,” says Deepak, adding that the norms for mobile towers in India are extremely stringent and strictly implemented by government agencies. Giving the example of a DDA directive banning mobile towers, Deepak says his department then educated the DDA officials about the reality, and the bye-laws were amended. “Today, government buildings, post offices, municipal offices, parliamentary precincts and even the Moti Baug residential colony, which houses senior government officials, including me, have mobile towers,” he says, adding that unless there is an adequate number of towers, issues such as congestion, connectivity and call-drop crop up. For instance, an average mobile tower in densely-populated Shanghai services 500 users, while an average tower in Delhi or Mumbai services 5,500 users. “Every time a train crowded with 3,000 commuters passes by, the network trips off. North Carolina Hurricane Matthew 2016 DOT NEWS. The 2 LMS50s a we purchased rode the storm out with no problems. They are located about 50 yards from Oregon Inlet. They saw sustained winds around 75 – 80 with gusts near 100. The cameras continued feeding images to the STOC throughout the event. Marked below are the locations of the towers. Thank you North Carolina for this great news. Our LMS50 units are unguyed units with wind handling characteristics like no other. These units are setup as self contained solar power backed up wifi camera monitoring stations for the state of North Carolina Department of Transportation. Units have been in service for several years with the agency and are excellent platforms for tracking equipment cameras etc providing the needed stability in winds you would not expect. They are also popular in Oman with similar configurations in the desert. Units configured with 50Hz power configurations and ability for deck equipment expansion. The large deck, triple axel, optional slideout offer clients many choices in deployment configuration setup. Landa manufactured climber training towers to educate climbers. Training towers will be used at the OAk Ridge National Laboratory in TN for climber safety training and personal development in safety. Many universities and training facilities around the world rely on Landa Mobile Systems training tower for their safety and reliability in the industry. Landa has been a proud member of NATE for several years and promoting tower safety education. We appreciate all the GSA orders and look forward to growing on the GSA Advantage program. “Our rapid-deployment portable communications towers are deployed with just about every military agency in the U.S.
We’re extremely proud to add NASA as a valued customer,” Landa said.Inside Tower News: Landa Mobile Systems closed its first GSA general schedule deal in September, 2016, with the National Aeronautics and Space Administration for its patented mobile tower unit, the popular LMS85 HW model. Landa Mobile Systems, a U.S. Government General Services Administration approved supplier, has sold the same portable 85-ft. lattice crank-up mobile tower unit to virtually every division of the military and to many companies for civilian telecom needs. In addition to Landa portable communications towers being deployed by most military agencies in the U.S. and many other locations around the world, the LMS 85 unit is used by U.S. Missile Defense Systems due to its reliability and is deployed in classified locations throughout the Pacific. Currently, Landa mobile tower units are also being tested by the Navy war department, and the company hopes to gain approval from the Navy for nationwide deployment. Landa portable mobile tower units have also become popular for civilian use. The same LMS85 HW mobile tower unit chosen by NASA was selected by the largest power company in California to be the communications cornerstone of its disaster relief program. Out rigger designs are the same. This improvement modification was implemented 3 years ago. Now with hundreds of deployments around the world we have never had a failure. The outrigger design footprint provides the stability in maintaining path alignments with the microwave dishes needing the 2°- 5° path alignment stability. When you compare the two below you can see why the orange units continue to blow over. It is recommended to always have engineering signoff on any deployment. Like doing a flight plan weight and balance before any flight its required. Landa Mobile Systems LMS150 HD our 150′ mobile tower in for configuration changes prior to next deployment. Increasing generator sizes and power conversions 240/50Hz systems operations changes as mission changes. Installing european breaker boxes, buildout accessories, adding additional axle for heavier deployment capability. Deck holes welded and repainted installing equipment shortly. They again leave our facility as good as new. This units on its way to NASA. This is their second order, and first GSA. We appreciate all our customers orders and look forward to many more deployments. This unit is amazing with its superior construction it has survived 165 mph winds with a full cell carrier load when properly guyed. Upcoming ANSI/TIA-322 standard will require new charts. An impact factor of 1.7 for all gin poles using synthetic load lines. We are updating our charts and if you bought a pole and registered it with us we will send you a chart at no charge. Poles not manufactured by Landa will not be supported with any updated documents. Landa Mobile Systems will continue supplying mobile towers for the states needs utilizing full solar operational units. For years now Landa has been satisfying their needs and look forward to a long servicing relationship. Nello suspends its mobile tower production. We have been advised by Nello this week 8/28/2016 when asked to quote 15 units for them. We declined the project wanting to not associate our product. Tristate towers supports Landa Mobile towers. Tristate Towers has been keeping their Landa Mobile Tower rental fleet busy this year. Need a portable setup contact vince at tristate, they will do a complete turn key and have several of our LMS 150 HD units for deployment. Mobile towers are like airplanes, don’t fly without doing a weight and balance. Every flight is different. Same on a fixed or portable tower don’t deploy without running the numbers by engineer for signoff. Best to be safe than sorry, 32 towers that were guyed to their outriggers blew over in Canada last year, they were not manufactured by Landa. Guying to out riggers does in nothing preventing a blow over. The new LMS PT12 with section options taking the pole to 60′ with all new charts, and metalized finish for durability and eliminating the slick touch. Landa Mobile Systems introduces new LMS GP30 Gin Pole. This 30′ pole will come in very handy in those special lifts. This is the one everybody has been waiting for and will have them coming off the assembly line this week. Look for updated photos as they come in from paint all metalized finished. Landa Mobile Systems introduces new LMS GP20 HD Gin Pole. Landa Mobile Systems issues new Gin Poles charts for 2016 LMS GP20 Gin Poles. As a government contractor Landa Mobile Systems. Landa is cautious on all export requests maintaining federal compliance. The Destination Control Statement (DCS) must be entered on the invoice and on the bill of lading, air waybill, or other export control document that accompanies the shipment from its point of origin in the United States to the ultimate consignee or end-user abroad. The person responsible for preparation of those documents is responsible for entry of the DCS. The DCS is required for all exports from the United States of items on the Commerce Control List that are not classified as EAR99, unless the export may be made under License Exception BAG or GFT (see part 740 of the EAR). At a minimum, the DCS must state: “These commodities, technology, or software were exported from the United States in accordance with the Export Administration Regulations. Diversion contrary to U.S. law is prohibited.” Compliance with the requirements described in § 123.9(b) of the ITAR constitutes compliance with the requirements of this paragraph for shipments containing both items subject to the EAR and defense articles subject to the ITAR. Landa Mobile Systems sending another batch of portable towers to the Caribbean. Cannot ask for a safer tower to deploy and have the ability to withstand severe wind. Landa Mobile Systems sending 10 LMS106 HW to the Caribbean. Cannot ask for a safer tower to deploy with the ability to withstand severe wind. Client ordered one week ago and we had to wait for the generators and cabinets to come in. Keep your clients safe and in communications with the Landa Mobile Systems portable tower units up to 150′. 2012 Section 1609.1.1 & 3108.4, and the recommendations of the Telecommunications Industry Association “Structural Standard for Steel Antenna Supporting Structures” ANSI/TIA-222-G-2.Facility AWS D1.1:2015 Structural Welding Code-Steel. per section 6.9. Product satisfies military and environmental standards according to MIL-STD-810F. Meeting all TIA requirements set forth by federal government. As pole manufacture at Landa we only address the gin pole mast and allowable load and tag capacities/angles based solely upon the mast’s rated strength. Affirming the pole was designed, built and load charts are in accordance with the ANSI/TIA-1019-A and the new upcoming ANSI/TIA-322 standard will require an impact factor of 1.7 for all gin poles using synthetic load lines. Rough to the touch like 80 grit sand paper and stronger than powder coating, comparable to hot dip Galvanize. Your going to love this product. Is your winch really man rated? ANSI/TIA-322 standard will require an impact factor of 1.7 for all gin poles using synthetic load lines. We are updating our charts and if you bought a pole and registered with us we will send you a chart at no charge. Landa preparing multiple LMS 106 HW units for oversea shipping to telecom in Puerto Rico. We are proud and look forward to many more as they experience the quality of workmanship, loading ability coupled with superior safety and longevity. There is not a better tower built out there. Our 150′ mobile tower USN Warfare Command heading to Hawaii. LMS 30 TT with safety climb headed to Wappingers Falls NY for serious climber training. Landa builds the safest climber training towers in the USA and they are distributed world wide. They can be found many schools and universities, IBEW, Iron Workers, Iron Workers Union, Xerex Inc, IBEW Local 1, University of Tennessee , American Venture Construction and Parsons to name a few. Training towers are excellent for firefighter rescue training, climber rescue. LM S106 HW 106′ LIFTING CAPACITY EXCEED 2900 lb / 1315 kg vertical lift. Our loading capacity exceeds any units built in the USA, from our low height of 26′ up to 106′. Engineering is able to design your deployment scenario without restructuring our basic units. We still test and rate the units with a tilt head load of 850lbs. LANDA Towers, Gin poles and trailers are constructed with 100% recycled USA steel. We are 100% in compliance with TAA regulations and doing our best to preserve the environment for our children and generations to come. LMS 150 HD for deployment in Hawaii. 160 Hurricane winds when properly guyed and a full cell carrier at the top for loading. Unit did not blow over in the Hurricane Dolphin in Guam this past year. The unit imploded with a broken able and we sent them another unit through FEMA. In serious storms from a cable break. These can be installed at the base of every section if you wish. LMS 106 HW towers arrive in Belize and Guatemala for service. LANDA MOBILE SYSTEMS CONTRACT GS-07F-106DA. Finish will be safer and last much longer. It will also give the operator a rough surface vs. smooth providing a much safer environment when handling Gin Poles. Zinc Spray Metallizing is done by melting zinc powder or zinc wire in a flame or electric arc and projecting the liquid zinc droplets by air or gas onto the surface to be coated. 99.5% pure or better zinc and the corrosion resistance of the wire or powder is approximately equal. Surface Preparation According to ASTM A780, the surface to be reconditioned shall be blast cleaned to SSPC-SP5/NACE No.1 near white metal and must be free of oil, grease, weld flux residue, weld spatter and corrosion products. The blast cleaning must extend into the surrounding, undamaged, galvanized coating. Application Zinc spraying of clean dry surface within four hours after preparation or prior to development of visible oxides. The zinc coating can be sealed with a thin coating of low viscosity polyurethane, epoxy-phenolic, epoxy, or vinyl resin. The details of the application sequence and procedures can be found in ANSI/AWS C2.18-93. LANDA extends a thank you for your confidence is us. As Landa finalizes GSA listings. Landa manufactures a complete line of Mobile Towers, Command Centers, Shelters, Gin-poles and Climber Training Towers. Verizon repair, operator raised unit with fractured (patented Delrin Tower Guides) which caused a hangup on a cross member solid rod back filled weld attached to tower leg. Our winch is so powerful it broke the 1 1/2″ cold rolled solid steel shaft, broke heavy chain and bent the other 1 1/2″ drum rod. We have placed warning sign on control panels advising operators not to operate with broken guides. As shown to prevent damage to tower in transport. The roads are rough and the towers weigh in excess of 3,000lbs. Landa Mobile Staff returns from the NATE Show in New Orleans. LMS is the center hub for this disaster response program in california supporting the emergency response program. Located on Meck Island in South Pacific on cliff edge and with high wind (105 MPH) rated unguyed and salt water deployment. Un-guyed. A deployed in Canada for several years now, where reliability are paramount. TOG our rental partner in Alberta has dozens of our units on deployment. Contacts them on our rental page for Canadian deployments Alberta. Multiple units for disaster response communication units. When it comes to reliability and stability our units are a winner hands down. A overseas units staged for container loading as our market grows in the Middle East and African market. When it comes to shipping we can deliver to an iceberg. A new overseas process for shipping over water. Motors are shrink wrapped and complete tower systems sprayed with protective coating to prevent any salt water damage. Full Mill spec paint on these units heading to Guam. A new overseas towers arriving in Guam following our treatment and subsequent exposure to the salt water and air. Units look as new when shipped from Plant and are warrantied. Our 150′ mobile towers heading for Middle East Deployments along with our new designed mobile command centers. 2016 the tested and proven design will handle all the weather and temperature conditions you can think of where a Mobile Tower could be placed. All sizes certified for deployment with any power configuration you may need. 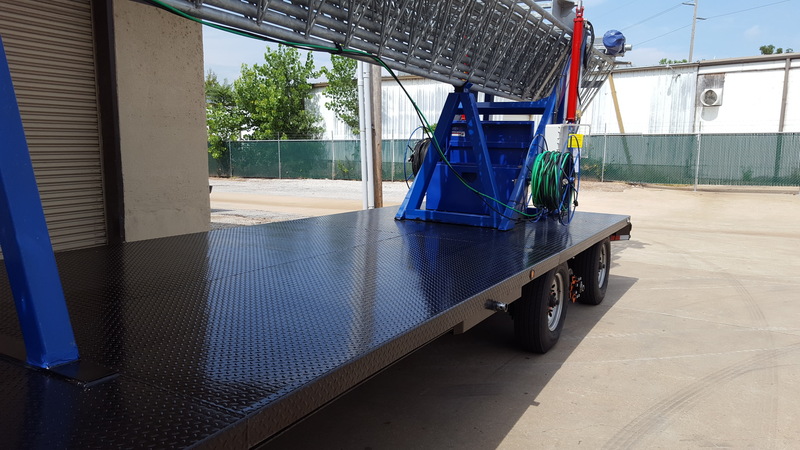 When mobility and safety and price are paramount we build them any size trailer mounted or skids. Soon to meet or exceed processes and testing in Low Temperature in accordance with Mil-Std-810 Procedure II., Operational cold start and/or Storage, High Temperature in accordance will Mil-Std-810 procedure I with solar loading., Salt Fog or Humidity in accordance with Mil-Std-810 Method 507.4 . Blowing Rain in accordance with Mil-Std-810 method 506.4, Blowing Sand and dust – In accordance with Mil-Std-810 method 510.4 procedure II., Transport shock, Transport vibration, Military Transportability Testing, Meets DOT specs., Shock and vib test for ruggedness Mil-810., Height & Weight distribution testing, Braking & Handling, Grading/Slope @ 10-30%, Steering & Handling, Turning diameter, Static roll-over, Stability & Handling, Towing compatibility. Photo of deployed unit in Guam and under carriage after 2 years and ocean voyage to get there show corrosion with this Mill Spec paint. One of 22 we manufactured that were shipped to Costa Rica. This one deployed in Guanacaste. End user ordered another 22 from a competitor to meet their build out deadline. Upon receiving 11 of the 22 units and all failing to lift the needed load they cancelled the other 11 not received on order. 2016 our new deployment in Canada, Where quality is paramount and when communications is depending on reliability 100% Landa Mobile units are first choice for rough environments. With the use of the Landa tower you will be connecting to multiple cell towers simultaneously this will give you very high redundancy. The amp will connect to all providers in many instances. Entrusts Landa Mobile Systems to be deployed UN-GUYED on grid and to serve as primary back bone in communication recovery deployments throughout the state. They just don’t put up any portable tower next to a major power grid without knowing its not going to blow over! California utility has purchased our units and deploys them for primary backbone. 2016 our new deployment in Canada. The cell antennas and RF radio antennas on tower are providing camp with wireless cell, data and RF Radio service. The amp is a commercial all carrier all frequency solution. It is already licensed with FCC and can be used any where in North America. Approved by all providers you do not have to contact them when you move from site to site. Registration of the amp will be done at time of install. Registration is one time only. 2016 our Providing internet backhauls providing internet and VOIP services in Canada, Coal Mines. 2016 news begins with our new deployments 1/04/2016 with Red Line approval to begin setup deploying units in Oman. We are pleased to service the countries in the Middle East and Africa with self contained units designed for complete remote full solar operations. Towers we configured with 100% solar for remote operation. Loading into containers at plant for shipment is something we are experienced with here at Landa and welcome any overseas orders.